It's even more important than ever before to treat E10 and E15 ethanol-blend fuels with a quality fuel additive. Given that car makers like Ford, Honda and Nissan have informed the marketplace that they're not going to cover fuel-related damages if the driver uses E15. ETHANOL DEFENSE from Bell Performance is the best multi-function defense against ethanol problems and ethanol damage on the market today, with commercial-grade strength to address all fuel-related problems in gasoline engines, including those caused by ethanol. Bell Performance is the father of the fuel additive industry, having produced the first fuel additive on record in 1909, followed in 1927 by the first formulation for its multi-function gasoline Mix-I-Go. ETHANOL DEFENSE combines multi-function mileage- and performance-enhancing features with ethanol protection, superior detergency and the most powerful combination of water-absorbing ingredients available, all combined to land a knock-out punch for ethanol that no other product can match. It is the only ethanol treatment you will ever need. So Many Claims About Ethanol - Which Do You Choose? Everyone seems to be coming out with their own “solution” for the problem. Many of these products don’t work or they simply add more alcohol to the fuel and claim to be solving ethanol’s water problems. No wonder people are confused. How do you know what's good and what's not in a world where everyone claims to be the best? In the wake of the ethanol “explosion” across the country, products have suddenly appeared on store shelves, all claiming to be the next-best-thing for fixing ethanol problems. None of them have stood the test of time as the gold standard for quality and performance that Bell Performance products have. You can rely on ETHANOL DEFENSE as your one-stop solution for all ethanol problems in all gasoline-power vehicles and equipment, large and small. When you use ETHANOL DEFENSE, you have Bell Performance's one hundred+ years of fuel treatment history standing behind you. Nobody else can say that. ETHANOL DEFENSE combines the proven benefits of the nations oldest and most-respected multi-function fuel additive with the most powerful combination of water-absorbing ingredients available, combining both to land a knock-out punch for ethanol that no other product can match. It is the only ethanol treatment you will ever need. It's easy to see why Ethanol Defense is the best ethanol fuel treatment on the market. There’s no way to avoid it – ethanol pulls water into the fuel wherever it is. This can cause the ethanol to separate from the gasoline, stripping the octane from the fuel and leaving you with a layer of poor quality gasoline on top and ethanol & water on the bottom (which, if burned, can cause performance problems at best and engine damage at worst). If you use ethanol in 2-cycle equipment, the news is even worse as water keeps the fuel from properly lubricating essential metal surfaces. When this happens, it doesn’t take long for catastrophic and expensive engine damage to occur. Many of these new “water-control” potions try to work by simply adding more alcohol to the fuel. Alcohol is what caused the problem in the first place; you can’t fix a water problem caused by alcohol by adding more alcohol. ETHANOL DEFENSE knocks out water problems with no alcohol, for a real solution to a real problem. Ethanol blends dissolve rubber, plastic and resin materials wherever the fuel comes in contact. Over time, this means expensive damage to equipment, especially small equipment. ETHANOL DEFENSE coats these parts and lubricates the upper cylinder area, providing superior protection against ethanol damage. The combustion improvers in ETHANOL DEFENSE help counter the fuel-robbing effects of ethanol by making more of the fuel available for combustion at the optimal time, while its detergent and surfactant package cleans all areas of the engine and fuel system to raise engine efficiency back to like-new condition. ETHANOL DEFENSE will improve mileage by up to 12% or more. When ethanol dissolves rubber and plastic, those resins are carried in the fuel and deposited into critical areas to cause performance problems and raised emissions, just like regular carbon deposits. ETHANOL DEFENSE removes these resin deposits, solving these issues for your engine and fuel system. ETHANOL DEFENSE also removes carbon, sludge and gum deposits from the fuel injectors, fuel system, valves and combustion chamber. A cleaner engine and fuel system operates closer to 100% efficiency than a dirty one, improving vehicle mileage and performance while reducing emissions. 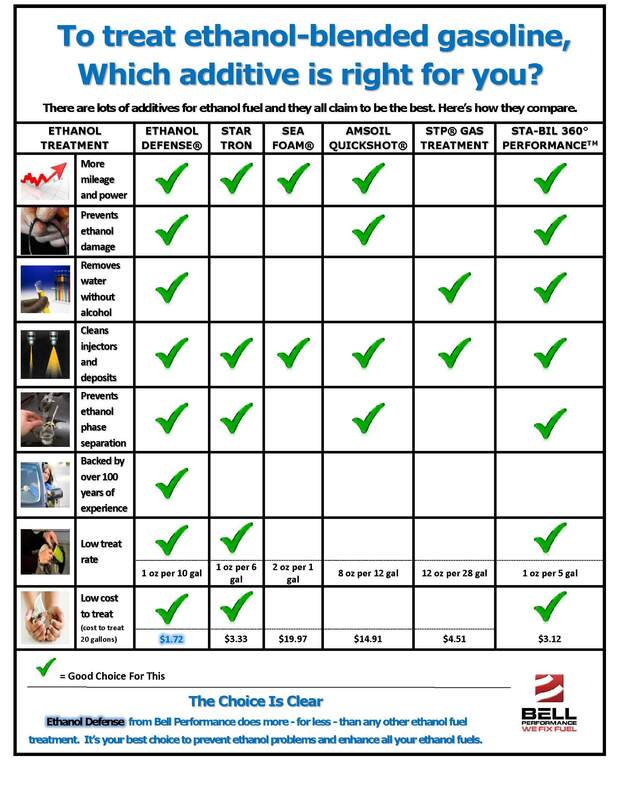 ETHANOL DEFENSE is concentrated to provide all of these benefits at an economical treat rate of 1 ounce per 10 gallons of fuel. This means treating your ethanol with ETHANOL DEFENSE costs just pennies per gallon. Trust the Father of the fuel additive industry to make the most effective multi-function ethanol treatment on the market. Trust ETHANOL DEFENSE from Bell Performance.